Facts about Black Pyramid Butterflyfish. "Scientific name for the Black Pyramid Butterflyfish is Hemitaurichthys zoster". 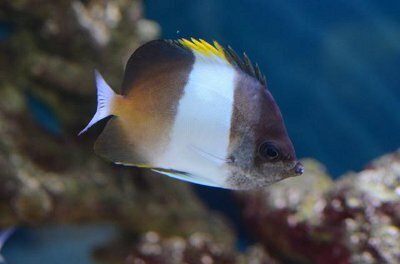 Black Pyramid Butterflyfish is also known as Black Zoster Butterflyfish, Coralfishes, Zoster Butterfly, Brushtooth Butterflyfish, or Brown-and-White Butterflyfish. The origin of the Black Pyramid Butterflyfish is Sri Lanka, Indonesia. Indicated by its name the Black Pyramid Butterflyfish, the fish is black in color, but also has some wide white bands running vertically along its body. This mixture of black and white colors gives the fish a beautiful appearance just like a butterfly. The Black Pyramid Butterflyfish grows up to a length of about 7 inches (18 cm) though most of the imported species normally range between 2 to 3 inches (5 to 7.6 cm) long. The Black Pyramid Butterflyfish are omnivore, (definition-they eat both other animals and plants). They have very fine hair-like teeth enabling them to pick out some small organisms that are inaccessible to majority of fish, for food. The Black Pyramid Butterflyfish are often found in schools along coral reefs and rocky reefs in shallow waters near the surface while feeding. Most of their foods comprise coral polyps, Christmas-tree worms, and tentacles of feather dusters. The Black Pyramid Butterfly prefers a tank of not less than 125 gallons (473 liters). In addition, the aquarium needs to have a plethora of live rocks to protect the fish from sunlight and to give it a source of derivative food. The Black Pyramid Butterflyfish is known to be quite shy and loves dark areas. It is a very compatible and peaceful fish and will always live together with other species in a single aquarium. The Black Pyramid Butterflyfish also feeds on xenia and soft coral as well as frozen and dried foods including algae, brine and Mysis shrimps. It performs well in a water temperature of between 72 and 78 F° (22 to 25 C°) in the marine aquarium industry, the Black Pyramid Butterflyfish has for a very long time help its place as one of the best aquarium fish. Test the water when preparing your tank for your fish: You will need to purchase a liquid tester so that you can test for Nitrates and Ammonia. The strip-style test kits are unreliable and a waste of money. You should use a dechlorinating product to remove the harmful chlorine from the water. Test for nitrite, ammonia, and proper PH level of between 8.1 and 8.4. The ammonia should always be 0, the nitrite should be 0, and the nitrate should preferably be below 20 ppm. If it's at or above 40 parts per million (ppm), you have too many fish or are not changing the water often enough. Cycling your tank is important, Follow the steps to cycle your tank. This establishes healthy bacterial and chemical levels. Remove 30% of the water from your fish tank each month with new water, or a 15% water change every 2 weeks is ideal for keeping nitrates lower. With corals in the fish tank, then 20% water change every month, or 10% change every 2 weeks.